With all the making fun of Notre Dame and various other hating we've been doing around here, we've barely had time to talk about one of our all-time favorites, Mike Alstott. During the Boiled Sports staffs time at Purdue, the Boilermaker football program was...well...less than what they are now. 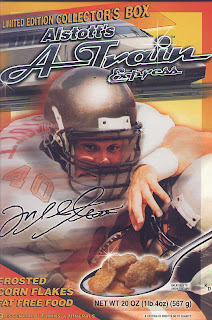 Our lone bright spot among the wreckage and 4-7 seasons was Mike "A-Train" Alstott. He barrelled through everyone, despite the fact that everyone knew he was our only option. Earlier this month, Alstott was put on IR by the Bucs and his career may indeed be over. Alstott is 33 years old (which in and of itself makes us feel old) and has had a terrific NFL career, making the Pro Bowl six times as a fullback and holding the Bucs all-time rushing TD record. In 1999, Mike rushed for 949 yards and caught 27 passes for another 239 yards for 1188 total yards -- not bad for a fullback. Alstott also had a five-TD game against Minnesota in 1993 and 264 yards rushing against IU in his final game for Purdue. The biggest crime in recent Purdue history is that Mike Alstott never played in a bowl game or for a winning team. The fact that he won a Super Bowl in Tampa definitely made us all feel a little better for this good soldier. If this is indeed the end of Mike's NFL career, we salute him and we will certainly not forget how much fun he was to watch in West Lafayette during some of the darkest years for the football program.